I am sure by now that you all know of my undying devotion to Ozeri. I have never been anything less than thrilled with any Ozeri product. They are such amazing quality. Naturally, since I have been so thoroughly impressed by Ozeri, whenever I require a kitchen or home product, I always begin with Ozeri. Nearly every time, they have something that fits my needs perfectly. Even from first sight, I know the product will be excellent, and yet I am still surprised by the outstanding quality when I actually use it. It's so rare that products live up to expectations, but exceedingly more so when the same brand consistent provides unparalleled quality. My most recent need was a high quality knife set. I have owned many knives and have never been fully satisfied with any of them. They broke to easy, were too heavy, too long, too short, too dull, and so on. 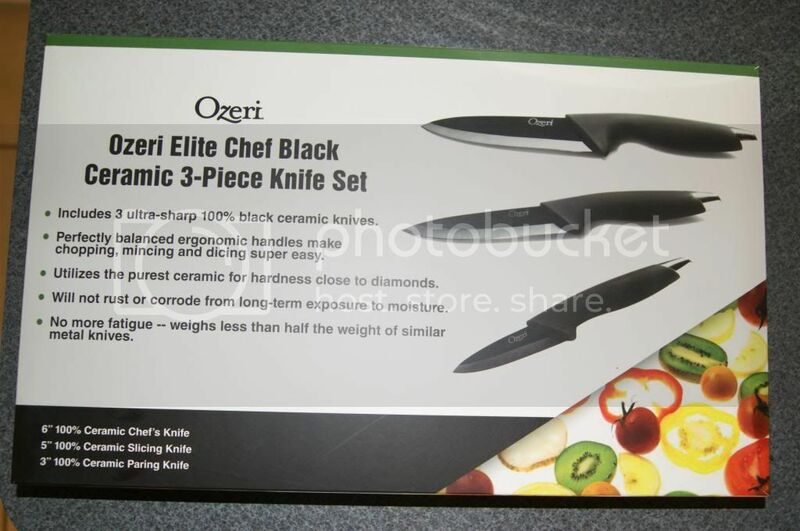 When I found the Elite Chef Black Ceramic 3-Piece Knife Set by Ozeri, I knew it would be wonderful, but still was expecting at least a few minor drawbacks. I was impressed by these knives at first sight. 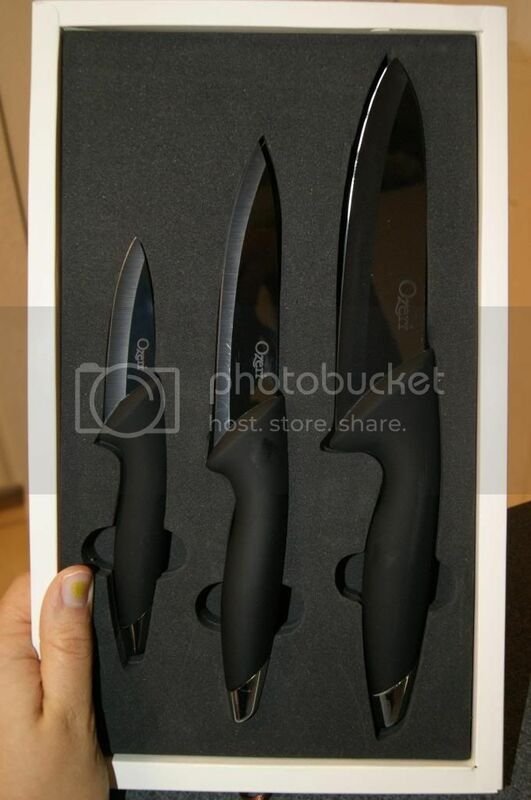 The packing is very attractive, and the knives themselves are very stylish. So sleek and "fancy". I love that the blades also have the black tint to them. It makes them more unique. The Ozeri inscription gives a very elegant look, and the Shape of the handles along with silver ends, give these knives a very chic look. The distinctive design does more than make these knives look great, the also perform on a level far above traditional chef knives. Since these are made with the purest ceramic, they are extremely hard. In fact, they are close to the hardness of diamonds, which is incredible. Because of this, they also maintain their superior sharpness 10x longer than tradition chef knives. The blades are finished with a reflective black veneer, and they will never rust, corrode or leach metal ions from long-term exposure to moisture, oils and acids in common foods as most regular knives do. Being ultra sharp and not ever rusting in itself it a pretty unbeatable combination, but if the knives are hard to use, it is a mute point. 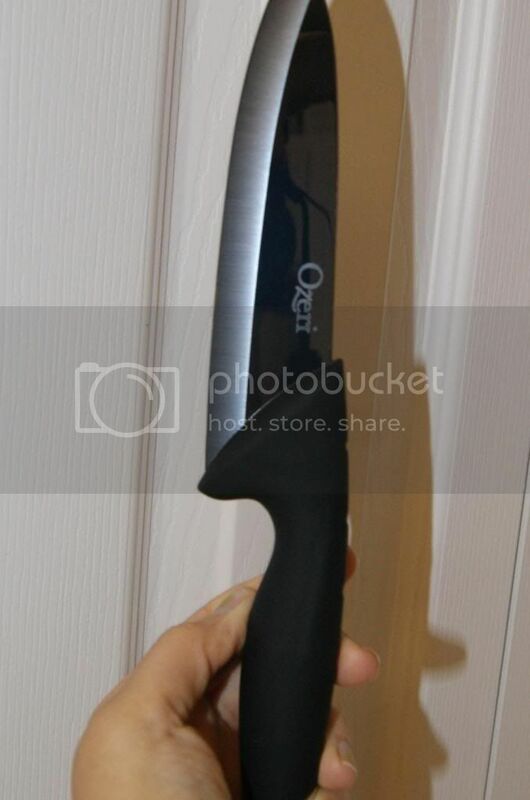 Of course, Ozeri knows this, which is why they made these knives so incredibly user friendly. The blades weigh less than half that of a traditional knife, making them so easy to hold and use for a long period of time. It makes cutting easier for more consistent and precise results. No more worries of hand pain from heavy, lunky knives. I love that. I used to be horrible at dicing and Julienne cutting because of lack of knife control. The handles are also ergonomic and perfectly balanced for optimum comfort and ease of use. Washing them is so effortless. You can simply rinse away the mess, although I use soap just to be safe. You can also let them soak. They don't need it, but it also will not harm them like it would other knives. This incredible set includes three phenomenal knives: a 3" Paring Knife, a 5" Slicing Knife, and 6" Chef Knife. Each is unbelievable. I used the paring knife for smaller thing like tomatoes and fruit. It works so well and does not squish my tomatoes like most knives do. What I really love about these knives is that I can FINALLY cut raw meat. All my other knives performed very pitifully on raw meats, even thin chicken breast fillets. It was so hard to make a meal with diced meat, and I usually did the extra work of cooking the meat first and then cutting it. What a pain, but never again thanks to Ozeri.